Some constellations are easier to spot than others. 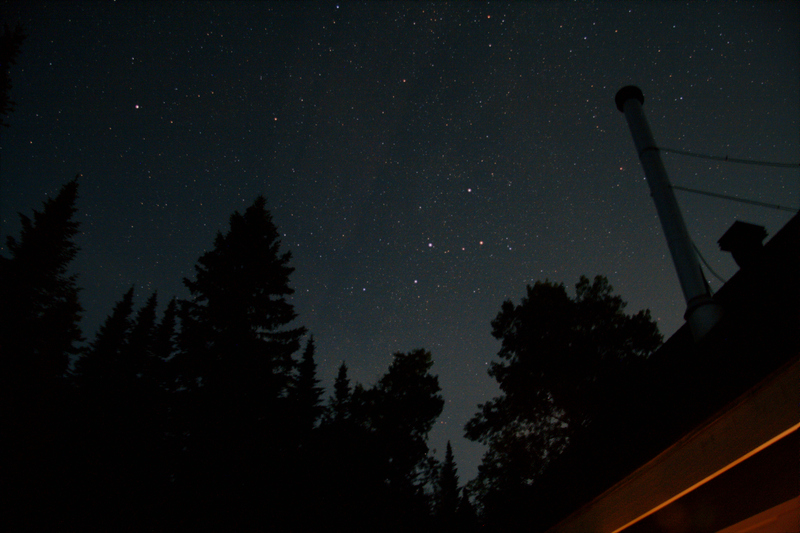 Cassiopeia with its distinctive W is visible year round in the northern hemisphere above the 34th parallel. In the image below it easily stands out from the fainter background stars. The five stars drawing a W in the sky are all naked eye magnitude 3 and brighter stars, and in the image above I used a layering technique to increase the color and brightness of those stars to really make them stand out. Increase the color saturation and brightness. Play with the curves to brighten the bright stars, but not the background sky. Use a mask as required to filter out the bright foreground elements, such as light reflecting off a building roof-line in my image above. This entry was posted in Image Processing, Observing, Photo and tagged Astronomy, Astrophoto, Astrophotography, Cassiopeia, Constellation, Night Sky by Benoit Guertin. Bookmark the permalink.